The Enugu State Police Command, Monday, said that its investigations into last Saturday’s attack on the Enugu government house was carried out by members of the Movement for the Actualization of the Sovereign State of Biafra (MASSOB), a group canvassing for the re-declaration of Biafran republic. Disclosing this while briefing newsmen in the state, Commissioner of Police, Mr. Abubakar Mohammed said that four persons were arrested including one that was seriously wounded and hospitalized, explaining that no death was recorded. He gave their names as Ifeanyi Chukwuma, Francis Nwaemeka, Sunday Okafor and Shedrack Onwuka Obi, all from Anambra state. He said that items recovered from the MASSOB members who stormed the Government House to forcefully take over the Enugu State seat of power at about 4.30am were two big banners bearing symbol of the Republic of Biafra, 34 assorted flags including those belonging to the defunct Republic of Biafra, Britain, United States, and Israel, one big bag containing charms, eight matchetes and a saw. He said that no gun was recovered from them. 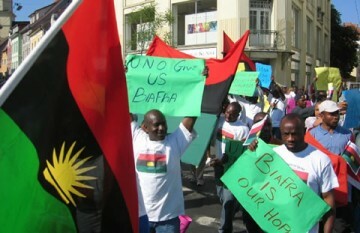 According to the CP, the suspects who claimed to be members of the pro-Biafra group had confessed that they were invited by some persons in Enugu to hoist the Biafra flags at the Government House, adding that his men were already out in search of their alleged sponsors whose identities he declined to make public. He said that the group of young men who invaded the Enugu Government House at about 4.30am on March 8, 2014 and armed with matchetes were on a mission to take over the Government House Enugu but added that until their sponsors were arrested it would be difficult to ascertain their actual motive. “In the process of interrogating them the arrested persons they gave us the names of those who invited them to Enugu to hoist MASSOB flag in Enugu. The motive of those who invited them is what we are trying to establish. We will charge the arrested persons to court while we will continue to look for their sponsors,” the Police Commissioner said.